This new reissue of a 1975 release from Greenslade is recommended. This includes a remastered version of the main album. That's on the first CD along with two bonus tracks. There is a second CD in the mix, too. It's a live recording from the same time period. It's not a bootleg styled recording (as are common to get these days), but rather a well-recorded show that sounds good. If you have enjoyed this disc in the past, this set is well worth getting. 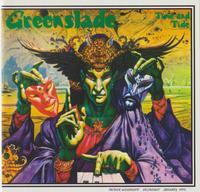 I think it might be one of Greenslade's better albums, too. This powers in with a quick paced jam that's sort of mainstream rock based. It works out from there to a fast paced proggy number. The vocals are high-pitched and bring a bit of an acid-rock thing. It drops to a mellower, almost psychedelic jam from there. This alternates between the two contrasting concepts as it works forward. It's a killer number that serves as a solid opener. While the keyboards stand out right from the scratch, there are plenty of other noteworthy elements. The rich vocal arrangement is cool. There are some parts of this that make me think of a proggier Elton John. I can also imagine that this was an influence on Queen. The tune works through some cool changes. Baroque styled harpsichord and non-lyrical chorale vocals begin this cut. The number is short (less than a minute-and-a-half) and never really moves beyond that. This keyboard dominated number definitely makes me think of something you might hear from the Alan Parsons Project. This instrumental is longer than the previous piece, but seems like the second part of a suite that continues with the next one. Seeming as if it comes out of the previous tune, there are things here that make me think of Klaatu, but this predates that band. There are also some definite Rick Wakeman like elements. This is energized, instrumental and packed full of twists and turns. It's also a lot of fun, but has some cool dramatic flavors in some of the sections. There is a powerhouse prog jam around the half-way mark that is just so tasty. It has some killer keyboard soloing and killer bass work at its heart. More of a mainstream rocker, this still has plenty of prog tendencies. It makes me think of Uriah Heep to some degree, but the keyboard soloing lends something different. The female backing vocals later lend a more soulful rock sound to the number. A slower moving, bluesy rocker, this isn't the most prog based thing here. Still, it works well. There is an instrumental section at the end of this that seems to segue into the next number. 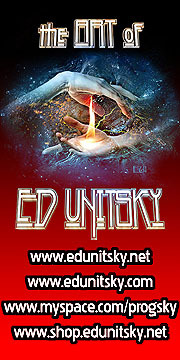 Coming in like a powerhouse progressive rock number, this is soaring, fast-paced and all class. It has several different movements and is packed full of shifts and turns. Keyboard based, this is an intriguing cut that has a lot of jazz tendency to it. It's mellower than a lot of the rest here. This piece is very artsy and just a bit weird. 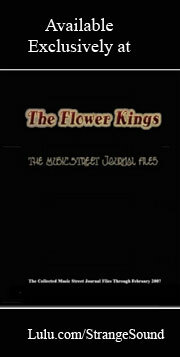 There is a sense of fun and adventure in this killer fast paced prog jam. This instrumental is a bit playful and a cool way to end the album proper. As you might guess, this is a shorter version of the cut from the album proper. It works well in this format, too. There is a bouncy, kind of (suitably) rubbery groove to this piece. Rising gradually, this is dramatic and powerful keyboard based music, despite its mellow nature for almost the first two minutes. The cut powers out from there to a fast paced prog jam that has definite elements that call to mind things like Emerson, Lake and Palmer. This has some rather freaky, but also quite cool, keyboard jamming as it continues. Fast paced progressive rock is on the menu here. This is a classy number that works well. Playful fast paced rock, this is a lot of fun. Of course, the keyboard work on this is all class. Coming in mellow, this works out with a bit of a bluesy, jazzy groove. The cut works through a number of changes as it works forward. There are more purely progressive rock movements along this road. After an introduction, keys bring this into being with style. This things works out into powerhouse progressive rock jamming that's a lot like Emerson, Lake and Palmer in many ways. Around the two-minute mark it drops way down as the song is rebuilt. The vocals join as it continues. The jam mid-track takes it into some seriously jazzy territory. As it comes out of that, the song is rebuilt around a mellower progressive rock arrangement. This piece drives back outward into the song proper as they come out of that movement. After a bit of stage talk they launch into this cut with a slow moving, slightly bluesy prog jam. This comes out of the previous cut, and is a cool live rendition of the song from the main album here. As you might guess from the title, the drums are a big part of this cut. In fact, it starts with a drum solo before working out to more of a full arrangement. It has a lot of world music in it at times. It's a fast paced cut that shifts this way and that as it drives forward. There is an extended drum solo that takes control after a while. It's a more extensive percussion workout. They bring things out from there with more cool prog jamming. It has hints of things like King Crimson, but also some jazz and more built into it. This instrumental gets decidedly powerful as the keyboards really shine over the top. Then the drums get another solo beyond that movement. There is a short blast of keyboards that return to end the piece. A playful kind of jam, this is very classical in progression and tone. It's a classy way to end things.